Are you ready for the Cotton Belt? As North Texas races forward with a rapidly growing population, increased economic development, and expanded employment opportunities, the Cotton Belt is on track to boost the region’s transit solutions. From increased mobility and greater flexibility to new economic, cultural, and social benefits, are you ready for how the Cotton Belt will transform North Texas? The Cotton Belt will deliver improved mobility and accessibility to North Texas whether you’re a passenger or not. Adding new rail service to these DART cities—Dallas, Carrollton, Addison, Richardson and Plano—the Cotton Belt will open-up access for all North Texans to easily travel to and from great destinations in these cities. 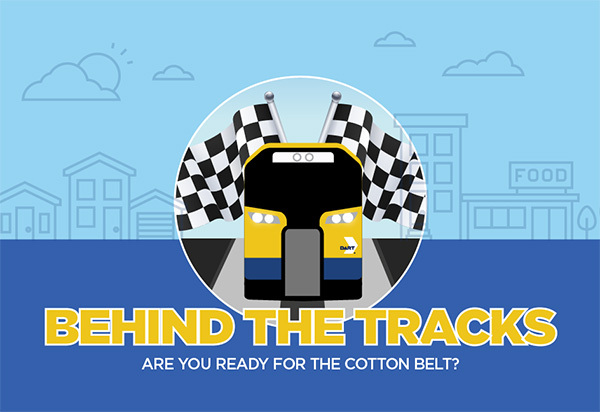 Speeding up your travel time, the Cotton Belt will help reduce rail travel time from east Plano to Dallas-Fort Worth (DFW) Airport from an hour and 45 minutes to less than 60 minutes. Freeing up space on our roads, the Cotton Belt will reduce the number of vehicle miles traveled per day by 80,000 by 2040, and save 3,800 hours of daily congestion delay. These time saving benefits will even extend to those of you who are not riding on the Cotton Belt. The Cotton Belt will help you get where you need to go, with system linkages to several other DART transit services. The Cotton Belt will integrate with three DART lines: the Red/Orange Lines in Richardson/Plano, the Green Line in Carrollton, and the Orange Line at DFW Airport, and a major bus transit hub in Addison. It will also connect with the future TEXRail Project (currently under construction), extending to DFW Terminal B Station, and with the DFW Airport Skylink People Mover. The result will be a more flexible transit system for North Texans, and transit options that will support the region’s expected 36 percent population growth by 2040. The benefits of the Cotton Belt will extend beyond those for commuters. Not only will the Cotton Belt relieve the crowded region and offer a more sustainable transit solution, it will help spur and support economic, cultural, and social opportunities for residents and visitors alike while strengthening our transit infrastructure overall. The construction of the Cotton Belt is expected to coincide with Transit Oriented Development (TOD), which will help open the flow of commerce and drive economic investment in and around the communities and cities it connects. This will mean higher property and housing values, new business opportunities, and increased growth opportunities for residents. It will also make our region more attractive for visitors, new residents, and businesses, driving a strong economy across North Texas. Construction on the Cotton Belt is expected to begin next year, so sign up for updates at http://www.DART.org/CottonBelt to keep up to date with the project as it moves forward.